By Anthony E. Clark, Ph.D.
Anthony Clark walks with villagers to the new church at Zhujiahe Village. Hebei, China, June 19, 1900. Surrounded by fields of corn, sorghum, apple trees, and cotton, two French Jesuits waited for the arrival of their executioners. Father Remi Isoré and Father Modeste Andlauer had heard that Boxers had already arrived in their small village of Wuyi, where the growing Catholic community had attracted the attention of the Fists of Righteous Harmony. The two priests decided to offer Mass rather than flee; they locked the chapel doors and began the Holy Sacrifice. As the Boxer crowd crashed through the door with their swords, the two holy priests knelt at the altar. They prayed as they were hacked to death. Their heads were displayed the next day at the village gate to warn other Christians what awaited them if they refused to denounce God, which was customarily done by performing some act of disrespect to a holy image of Christ or his Mother. Hebei, China, July 20, 1900. More than 3,000 Chinese faithful had crowded into Zhujiahe, a tiny Catholic village on the vast flatlands of China’s Zhili province, today known as Hebei. Normally the village held only 300 poor peasants, but Boxers were sweeping through northern China destroying churches and killing Catholics who refused to apostatize, and Catholic villagers from other areas had accumulated there to marshal their forces and defend themselves. By mid-morning the two Jesuit priests in the village, Father Paul Denn and Father Léon Mangin, could see the signs; it appeared that in God’s providence they would all wear martyrs’ crowns by the end of the day. The two exhausted priests donned their sacred vestments—stoles and chasubles—and gathered with 1,000 others into the small village church, where they prayed aloud beside the holy altar. Having killed nearly everyone outside of the church building, the Boxers and Qing troops at last pried open the chapel doors and directed a barrage of bullets into the crowd. Fearful that bullets would kill her pastor, Mary Zhu leapt in front of Father Mangin and extended her arms to form a cross. She received his bullets and fell to the floor. Exhausted from shooting, the attackers at last barricaded the church doors with mattresses soaked in kerosene and ignited the building with sorghum reed torches. The sorghum palms the villagers had planted became the martyrdom palms that ushered them into heaven—all but a handful of 3,000 Catholics were massacred that summer day at Zhujiahe village. Hebei, China, December 9, 2011. Passing by fields of crops, village walls with nationalist slogans, and factories billowing dark smoke into the skyline, I imagined what Hebei looked like in 1900. One can now reach Dezhou from Beijing in an hour and a half by speed train; 111 years ago it took several days by horse or wagon on rut-filled mud roads. I had visited villages before where simple men and women—farmers who worked the land in bitter conditions—had earned the crowns of martyrdom, but I knew that I would soon stand where the largest anti-Christian massacre in China’s long history had occurred. I would soon stand on earth that had absorbed the blood of the 3,000 Catholics who were killed during the fevered violence of the 1900 Boxer Uprising. I was taken first to Wuyi, where two Jesuits died alone at the altar, and then to Zhujiahe, where two other Jesuits died along with 3,000 poor Catholic villagers. Two priests were scheduled to assist me as I visited Hebei, and though neither had known in advance that I wished to visit specifically the two small villages of Wuyi and Zhujiahe, God’s providence arranged that the pastors of those two churches accompanied me as I retraced the footsteps of the saints. Local Catholics met me and our small entourage at the newly constructed train station, and I was escorted first to Number Three Village—many old, literary names of places and institutions have been reduced to numbers in “New China”—where Father Zhang celebrated Mass with us before settling into a pleasant discussion under a panoply of images and photographs: Pope Benedict XVI, Cardinal Zen of Hong Kong, St. Thérèse of Lisieux, the Immaculate Heart of Mary, and the priests of the diocese. “The history of martyrdom here is still sensitive,” insisted Father Zhang, “so let’s all keep this secret.” Our first stop was to be Wuyi, where we were greeted by Father Luo, the diocesan chancellor and pastor of the Wuyi chapel. 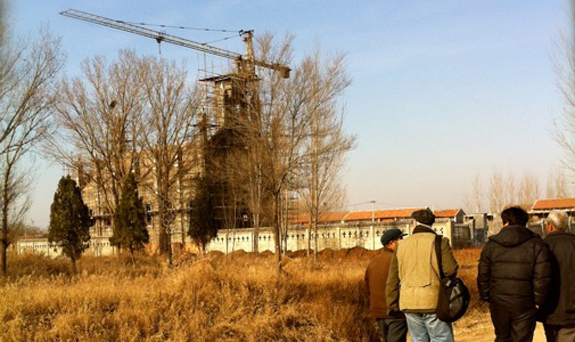 There is both irony and paradox in the Church’s present condition in China, for while the government is indeed providing more property and funds to Catholic agencies, new lands provided for church construction are often located in isolated and industrial areas. The Wuyi church has been relocated some distance from the original Catholic church where Saints Isoré and Andlauer suffered martyrdom during Holy Mass, and today rests amid large plots of what look like post-apocalyptic rubble and industrial wreckage. But once one drives into the walled church compound, he is welcomed by two attractive pavilions, each dedicated to one of the two Jesuit martyrs of the village. In fact, devotion to these saints seems to sustain the small group who attends Mass in a diminutive chapel—one of the parishioners had painted two large images of Isoré and Andlauer that were featured prominently in the church and venerated by the faithful. Having written in my book about the dreadful extermination of Catholics at Zhujiahe, and having read the personal accounts of those who witnessed the holocaust, I was uneasy as I approached the village. The cruel execution of two people was conceivable, but calling to mind the destruction and massacre of an entire Catholic community of 3,000 souls was oddly unreachable in my imagination. After a long hour’s drive through a bitterly cold landscape, on roads covered in mud and riddled with huge potholes, we finally turned into the village entrance. The villagers knew we were coming and had gathered to greet us on the spot where the village martyrs died in the chapel as they prayed with Fathers Denn and Mangin. Only around one quarter of the population of Zhujiahe is Catholic today; in 1900 it was entirely Catholic. But since all but seven of the village’s Catholic population was killed in 1900, it has struggled to retain its Christian identity; among those who greeted me were two elderly women who were direct descendants of the martyrs who died during the Boxer catastrophe. One old woman, Lucia Zhu, is honored by the village’s Catholics for being a direct descendant of St. Mary Zhu, the woman who stretched out her arms to receive the bullets intended for St. Mangin, dying as Christ did, arms outstretched in a cross. The plot of ground where the old church was located is now flattened and being prepared for a small garden with pavilions and honorary stone memorials that recount what happened there more than a century ago. Standing on the soil where martyrs had died, the villagers told me about the fate of Zhujiahe during their own lifetimes. Despite their attempts to safeguard the monuments and human relics through the Maoist era, during the Cultural Revolution (1966-1976) reckless chaos and senseless violence precipitated a 10-year campaign against anything religious, foreign, or “counterrevolutionary.” In the new, revised official rhetoric of the state, the Boxers were no longer the superstitious ruffians they were previously labeled, but rather were esteemed as patriots who fought against imperialist aggression. Since Zhujiahe had become a pilgrimage site for Catholics, the enemies of Communism, and since it had also been targeted by Boxers, the new heroes of Communism, Mao’s Red Guards, set out to eliminate any remnant of religious veneration in the village. How can one remove the skeletal remains of 3,000 victims buried beneath the village homes, church, and fields? The Red Guard radicals made every attempt to remove and desecrate these holy remains. According to the villagers, the Red Guards first attacked the church building, and then took the bulk of the human remains from the 1900 massacre and tossed them into a nearby culvert. With some of the skeletons they filled a millet grinder and dispersed the ground bones onto the village soil; this is why Catholics in the diocese call Zhujiahe “Shengdi,” or “sacred earth.” Before the Red Guards had arrived, the villagers buried several stone tablets underground, on which many of the names of those who died in 1900 were inscribed. Some of these monuments are still buried beneath households that were later built on top of them. Naturally the Red Guards could not remove the remains of all 3,000 martyrs, and many monuments remain buried beneath the soil. The bones and the names of these holy men and women are still discovered when the earth is broken to build a house or plant new trees. After visiting the ground where the old church had been, Father Zhang led us to the modest home of one of the village Catholics; they served us tea, fruit, and seeds—it was more than these poor farmers could afford. I was placed beside Lucia Zhu, who gave me a card with an image of her ancestor, St. Mary Zhu. Lucia radiated; it was her relative who offered herself on behalf of her pastor. Several members of the Zhu family, all Catholic descendants of the original clan who established the village, recounted what happened on the day of the massacre. They noted that only seven people survived the attack, and only two of these survivors were members of Zhujiahe Village. Both were young children who managed to go unnoticed as the Boxers and Qing troops killed men, women, and other children. These two survivors are the ancestors of all of the Zhu clansmen who still farm in the village today; they are a devout Catholic family that has endured not only the ravages of the Boxer Uprising, but also the precarious whims of the Maoist era. Anthony E. Clark is an associate professor of Chinese history at Whitworth University and the author of China’s Saints: Catholic Martyrdom During the Qing, 1644-1911. He is also the host of the upcoming EWTN television series The Saints of China: Martyrs of the Middle Kingdom.